How do I detect what .NET Framework versions and service packs are installed? What is the correct way to determine which .NET Framework versions and service packs are installed? Is there a list of registry keys that can be used? Are there any dependencies between Framework versions? The registry is the official way to detect if a specific version of the Framework is installed. except for .NET 1.0, where the value is a string (REG_SZ) rather than a number (REG_DWORD). As you can see, determining the SP level for .NET 1.0 changes if you are running on Windows Media Center or Windows XP Tablet Edition. Again, .NET 1.0 uses a string value while all of the others use a DWORD. For .NET 1.0 the string value at either of these keys has a format of #,#,####,#. The last # is the Service Pack level. Again, .NET 1.0 uses a string value while all of the others use a DWORD. for .NET 1.0 the string value at either of these keys has a format of #,#,####,#. The #,#,#### portion of the string is the Framework version. for .NET 1.1, we use the name of the registry key itself, which represents the version number. Finally, if you look at dependencies, .NET 3.0 adds additional functionality to .NET 2.0 so both .NET 2.0 and .NET 3.0 must both evaulate as being installed to correctly say that .NET 3.0 is installed. Likewise, .NET 3.5 adds additional functionality to .NET 2.0 and .NET 3.0, so .NET 2.0, .NET 3.0, and .NET 3. should all evaluate to being installed to correctly say that .NET 3.5 is installed. 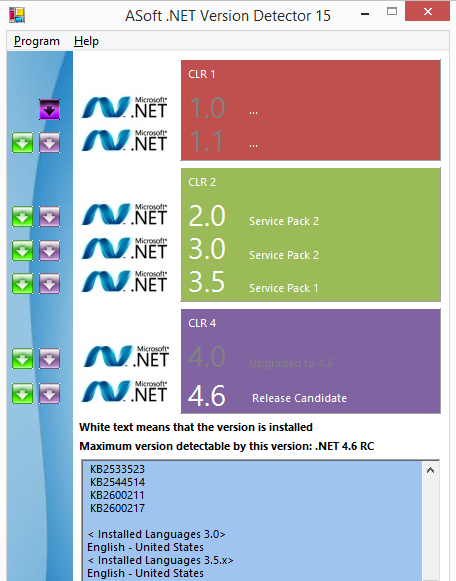 .NET 4.0 installs a new version of the CLR (CLR version 4.0) which can run side-by-side with CLR 2.0. There won't be a v4.5 key in the registry if .NET 4.5 is installed. Instead you have to check if the HKLM\Software\Microsoft\NET Framework Setup\NDP\v4\Full key contains a value called Release. If this value is present, .NET 4.5 is installed, otherwise it is not. More details can be found here and here. Unfortunately, it doesn't appear to work, because the mscorlib.dll version in the 2.0 directory has a 2.0 version, and there is no mscorlib.dll version in either the 3.0 or 3.5 directories even though 3.5 SP1 is installed ... why would the official Microsoft answer be so misinformed? The Framework 4 beta installs to a differing registry key. I wanted to detect for the presence of .NET version 4.5.2 installed on my system, and I found no better solution than ASoft .NET Version Detector. Now that .NET 4.5.1 is available the actual value of the key named Release in the registry needs to be checked, not just its existence. A value of 378758 means that .NET Framework 4.5.1 is installed. However, as described here this value is 378675 on Windows 8.1. There is a GUI tool available, ASoft .NET Version Detector, which has always proven highly reliable. It can create XML files by specifying the file name of the XML output on the command line. You could use this for automation. It is a tiny program, written in a non-.NET dependent language and does not require installation. I was needing to find out just which version of .NET framework I had on my computer, and all I did was go to the control panel and select the "Uninstall a Program" option. After that, I sorted the programs by name, and found Microsoft .NET Framework 4 Client Profile. $v4Directory = "hklm:\SOFTWARE\Microsoft\NET Framework Setup\NDP\v4\Full"
It was written based on How to: Determine Which .NET Framework Versions Are Installed. Please use THE Get-FrameworkVersion() function to get information about installed .NET framework versions. This gives the latest version of NET Framework installed. One can also try Raymond.cc Utilties for the same. See How to: Determine Which .NET Framework Versions Are Installed (MSDN). Note that for "versions 4.5 and later" there is another function. Not the answer you're looking for? Browse other questions tagged .net installation version-detection or ask your own question. How to check if .NET Framework is installed? How to find out if .NET 4.02 is installed? How do I find the .NET version? What's the foolproof way to tell which version(s) of .NET are installed on a production Windows Server? What version of .NET ships with what version of Windows? Homebrew install specific version of formula? What is a NullReferenceException, and how do I fix it?